June has arrived and the weather is finally cooperating. In fact, we had an absolutely beautiful weekend. On Friday evening, I joined a few of my knitting companions at a gathering at Barnes and Noble to celebrate the launch of the book, Knitting to Share. This book of patterns to knit for charity benefits the organization Care to Knit. I've done some knitting for causes before and plan to volunteer to knit various items for this organization. Some of the patterns in this book are very sweet and most are quite easy. Yesterday, I spent a relaxing afternoon knitting and spinning with many more of my knitting/spinning friends at the Amityville Historical Society Heritage Fair. The fair is much like a flea market with things to buy and other things to do. We found ourselves a nice spot under a tree and attracted quite a bit of attention from passersby, especially for the spinning. Some people weren't sure what we were doing and asked lots of questions. Children especially were interested in learning about spinning. I wish I'd remembered to bring my camera but since I didn't, there are no pictures. Ah well. We completed the weekend this afternoon with our usual Sunday afternoon meet-up at Panera. It was a busy, crafty weekend! 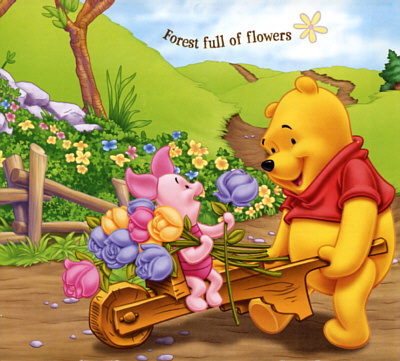 Recently, I remembered that I have a Pooh that actually blows bubbles. 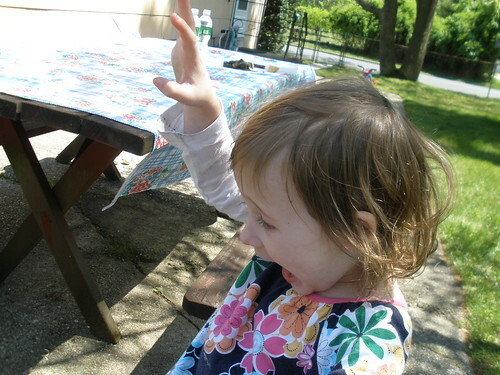 How I could have missed showing this exciting thing to Lorelai is beyond me. She LOVES it. 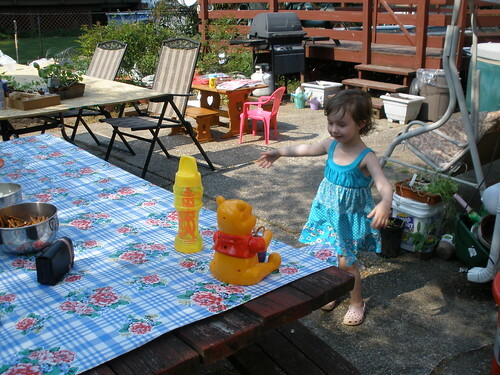 She danced around while Pooh did the work blowing bubbles. She's so silly. I can't even remember what was happening here. Here's a blanket I knitted for my cousin's grandson. When my aunt passed away, my cousins gave me some yarn and knitting books she had. With the books, I found a scrap of paper with a stitch pattern written on it. 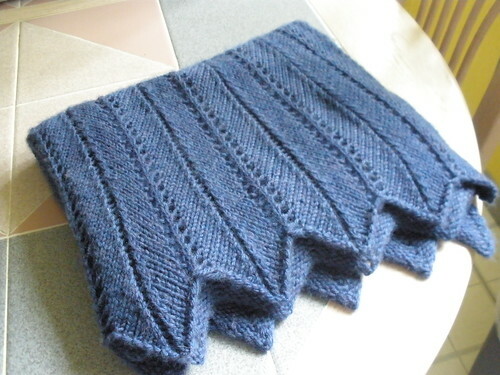 I made a swatch to see what it looked like and discovered that it was the pattern she used to make afghans, including baby blankets. I used the pattern to knit this blanket for my aunt's great-grandson. I'm so pleased with it. Some sparkly yarn! 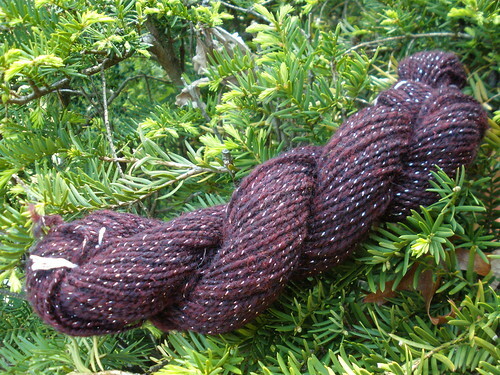 I spun this purple wool and plied it with a strand of silver thread. Very pretty. This is half of the fiber so I'll get another skein of yarn out of this. I have no idea what to knit with it. I'm content to look at it for now. 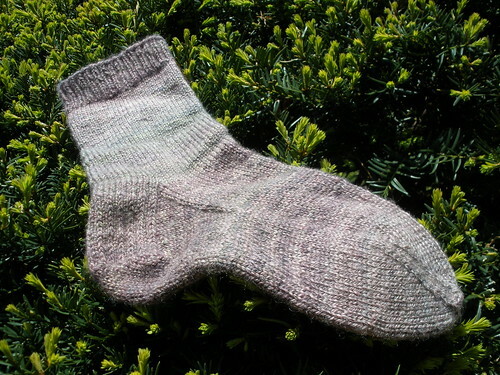 presenting my first sock knitted from my handspun sock yarn. I'm working on sock number 2 at the moment. It's so pretty and soft! My next challenge will be designing sock yarn from raw fiber.